The three-month span from June to August is always the worst season. It’s a season of armpit sweat; a time of searching for shade or air conditioning. And if it felt like this summer sucked even more than usual, you’re not imagining it. The summer of 2018's hellacious heat set a new record. 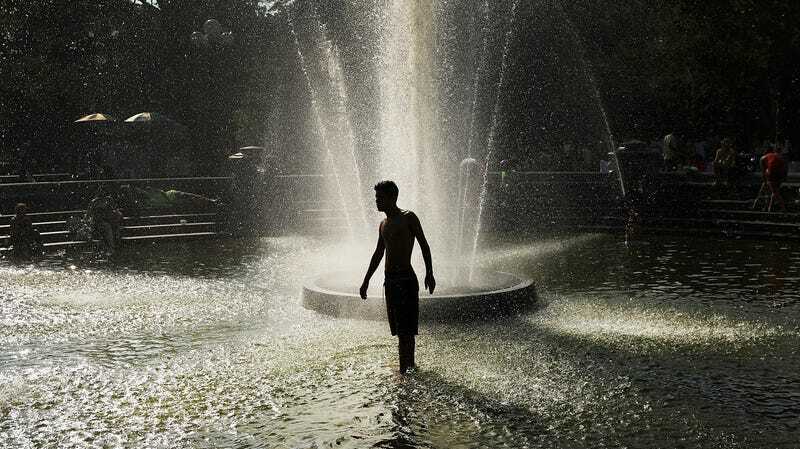 U.S. summer nights were the hottest ever recorded, according to data released on Thursday by the National Centers for Environmental Information. Factoring in daytime highs, summer 2018 came in as the fourth warmest on record for the U.S., with temperatures 2.5 degrees Fahrenheit above the 20th century average. Every summer in the top 10 has occurred since 2002. Local temperature records further illustrate just how freaky warm nights were this summer. There were 6,160 record set for warm nights across the U.S. this summer, outpacing record cold nights by a ratio of 7.5 to 1. The Northeast has had wild heat waves (which have yet to stop as evidenced by the 104 degree Fahrenheit heat index in New York today). California has also been wickedly hot, and those hot overnight lows have played a major role in fanning flames. When temperatures drop at night, fires usually “lay down” and firefighters are better able to contain them. That didn’t happen much this summer, which is how we got the Carr Fire ravaging a city overnight. Overnight heat is also a major public health concern, especially for children and the elderly, who are more vulnerable to heat-related illness. It’s also, somewhat counterintuitively, an acute problem in areas where extreme heat isn’t the norm because people aren’t used to warmer temperatures or don’t have air conditioning at the ready to cool down. You can probably thank climate change for this garbage summer. Overnight lows are warming twice as fast as daytime highs and nearly every heat wave that occurs now is getting an extra bump from climate change. That means the most trash season will only become more trash. I need a beer.